For META, the team is continuing to work through issues such as user provisioning, password policies, challenge questions, self-service and attribute synchronization. The team has a draft communication plan to inform the impacted users. This plan needs to be presented to leadership. For AD, we are at a crossroads on the SIMS phase 1 project regarding Active Directory. We are actively seeking a decision on non-technical aspects of the project, which will have a long-term impact on the complexity of the technical design. We will engage an expert vendor for Active Directory design once this decision is made. The membership of the Software Advisory Board is being finalized. The first draft of the charge document for the Software Advisory Board and the first draft of the software usage report, by department, will be reviewed by the project team in our next meeting. The group continues to monitor the new MFD workflow and collect cost savings data. Analyses of data on toner spend by departments for 2011 and part of 2012 is underway and will help identify areas of potential significant cost savings. Staff are actively working with groups that have not completed registration by the deadline. Two additional major groups have worked with the evaluation committee to review their results and develop plans for their future server hosting needs. The SCV team met with members of IT Senior Leadership to review costs and cost saving tracking methodology. IT received approval to execute on the amended transformer power expansion project that was carried forward from phase one and funding information has been provided to Facilities Services in order to begin the project. TSC IT Staff Orientation and Training are reviewed and completed. The project team has started to work on creating, evaluating and reviewing KPIs to capture and measure the workload and productivity of the TSC. During the most recent bi-weekly team meeting, we agreed to begin advertising test networks into the KU Peering Network. This change is scheduled for 9/6/12 at 6:30am. KU-Lawrence continues to develop plans for a major change to the Domain Name System (DNS) architecture. KU – Medical Center and KU-Lawrence have continued to make excellent progress at eliminating the overlapping IP address space. 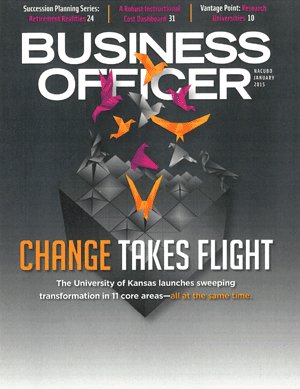 KU – Lawrence has transitioned the stewardship for Changing for Excellence Network Optimization from Christopher Giem to John Lawrence and Joey Marschie. The Office of the University Registrar and Admissions Transcript Processing subprojects are moving into production now. The HR subproject continues in the implementation phase. The CLAS subproject continues in the design phase. The consultant completed the workshops related to Business & Industry outreach. The project team is now waiting for the final report. The Graduate Studies and Business & Industry Outreach CRMs have been given the green light to move forward, separately from the Student CRM, with the caveat that in three years we will look at bringing all of these CRMS together. Project meetings have begun. All early adopter site administrators continue to migrate their websites to the new CMS platform. Anticipated completion date for most early adopters is September 2012. The fall pilot of Early Warning began on 08/20/2012 and includes nine courses. The fall pilot began on 08/20/2012. Students in the pilot will be able to schedule appointments online with pilot course advisors.